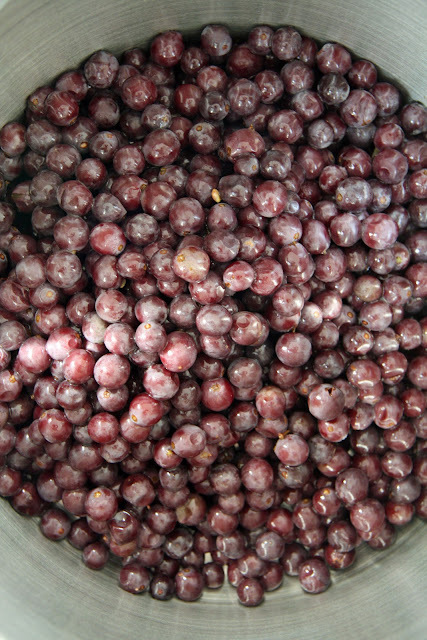 This is the first season that we made jam from our concord grapes. I have to say that it was exciting to think of eating jam from fruit that grew on our land. I am also quite a connoisseur of jam (meaning I eat an awful lot of it!). 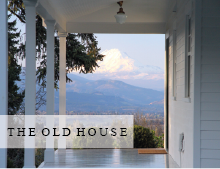 Oh, how I looked forward to opening the refrigerator and grabbing a jar of our homemade jam, grown right outside the kitchen door. Well, we'll just say that we'll have to work out a few kinks and consider this year's batch to be a test run. In the end we didn't end up with so many jars. So we've reserved them for a small handful of family members (people who will think it tastes good based on the pure effort alone). Here are a few of the jars (there were a total of eight in all). Here are the grapes ready for cooking. 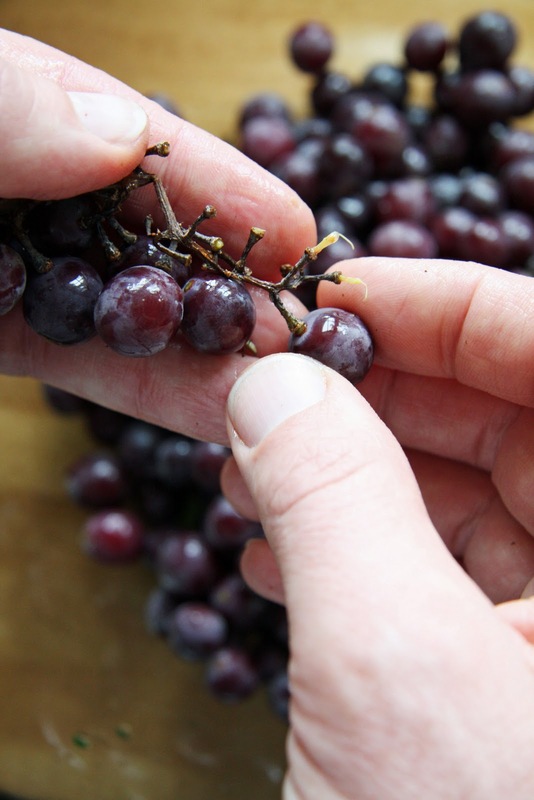 Taking the grapes off the stems was by far the most arduous part of the process. And when I say 'arduous' I mean that it looked like Mike was doing it for quite some time... I'm admitting here nearly at the end of this post that I hardly helped make the jam. wisdom to stick to the recipe. He possesses these qualities in abundance! Well, our stockings are hung, the tree is trimmed and I've officially consumed at least an entire loaf of pumpkin bread over the last several weeks. I'm sure your jam takes delicious! Merry Christmas to your sweet family!! I am sure your jam will be appreciated and enjoyed by those who receive. Just the fragrance alone will entice them. Oh, thanks for reminding me....pumpkin bread. I think you should sell it. The jam looks beautiful! My best friend and I decided one year to make kumquat preserves from our respective kumquat trees. Washing, drying, cutting and seeding the kumquats seemed to take us days - this was an effort never to be repeated and we still laugh about the summer we made kumquat jam. Yum, good work, guys! I'm sure it's delicious. Thank you for your visit to my blog, I'm always so happy to hear from you. Sending you and your beautiful family the happiest of holiday wishes! I love love love the way you packaged the jam. I'm sure it's delicious too! Buon Natale! I love your blog! Yum! And love the burlap bags. My sister always sends homemade jams from her garden at Christmas time. Always enjoyed and warms the heart. Merry Christmas to you and your family, Trina - I'm so happy to have discovered your blog this year. wishing you and your beautiful family a happy Christmas. Merry christmas to your sweet little, jam faced family! Looking forward to more of your beauty and inspiration throughout the new year! Making perfect jam really is an art! Ryan and I canned grape juice the first year we were married. It took us forever to get it down and by the time we finished our bushel we thought we were master juice makers. Unfortunately, when we actually got around to tasting some of our juice, we found it tasted quite burnt. Not all of it was spoiled, but we did get a good laugh. It's become known as campfire grape juice. 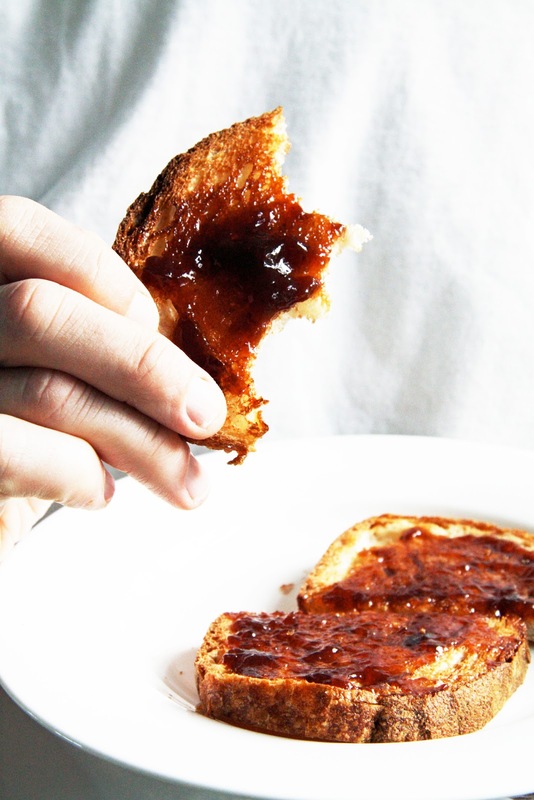 I'm sure whoever is lucky enough to get your homemade jam will love it! It looks yummy! A sweet neighbor dropped off some homemade jam to us yesterday, yum!! Merry Christmas to you...enjoy the time with those precious little ones. The jam looks delicious and the packaging is soooo pretty. Merry Christmas! Happy Christmas to you and your family. Enjoy the simple things. Oh Trina, I would die to have a jar of your concord grape jam!!! Have a wonderful Christmas with your family. I'm sure the twins are a little more interactive when it comes to Christmas excitement!! All the best for 2012!! I'll look forward to all of your lovely posts in the new year! I have a Champion juicer that you just put everything in, press, and the juice comes out one end and all the stems, seeds, and skins come out the other. What a time saver!! It looks yummy no matter what!! Have a great holiday with those two little twins. I will be enjoying my 35 year old identical girl twins this year and their daughters (one each born 6 years and 2 days apart...how strange is that! One on the 26th and one on the 28th!). 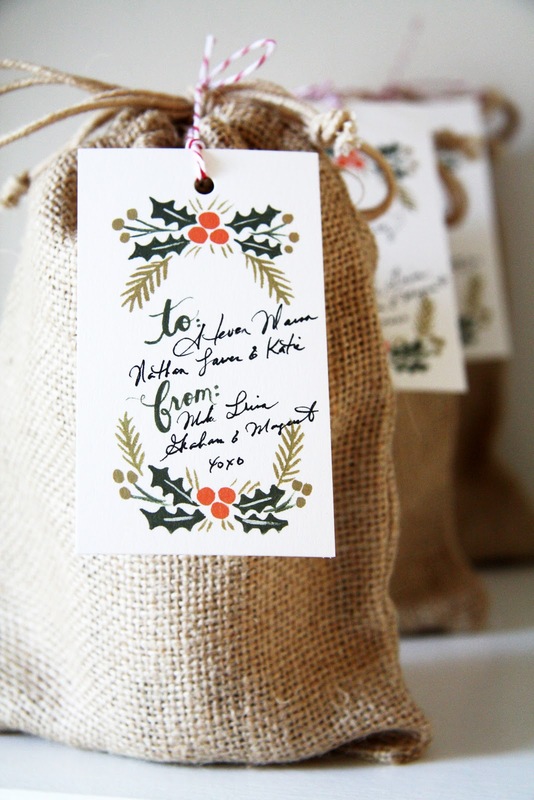 Love the burlap packaging and cute tags on these! What a thoughtful gift. A very Merry Christmas to you and your family. Merry Christmas! I'll bet your Concord grape jam was wonderful! I canned and made jam for the 1st time this year. I made "Spiced Wild Maine Blueberry Jam" and it was to die for! The berries were delivered to me direct from Hancock County, Maine by my neighbor! This looks so wonderful, Trina. I'll bet folks were delighted to receive it. My wonderful teenaged son gave me a book about canning in small batches, which has me so much more inspired to can this coming spring, summer, and fall. 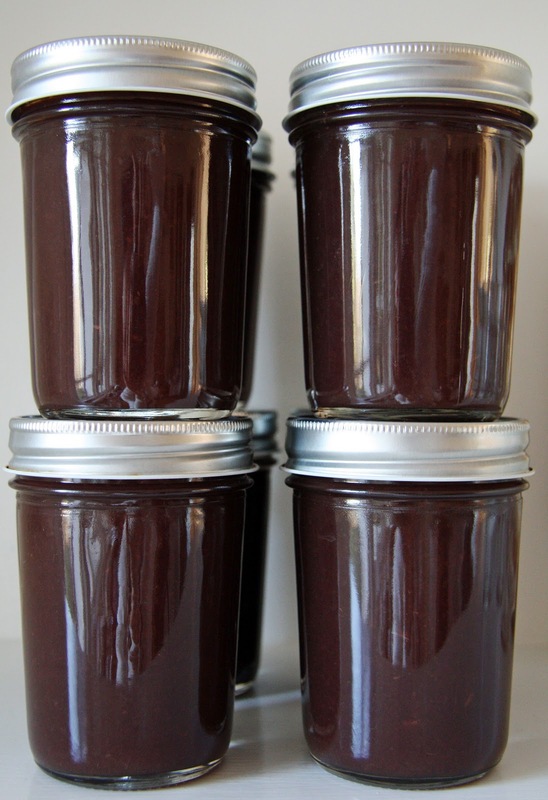 Concord grape jelly is one of the recipes too!